Budleigh Salterton lies to the west of Sidmouth towards Exeter. Although small and peaceful, the town attracts a lot of visitors who are drawn by the unspoilt nature of the area and the beautiful setting. The town is literally a stones throw from the beach with many houses jostling for space along the small beachside area. The beach is made up of pebbles and is quite steep, it stretches away from the town to the east for a distance of around 2 miles. 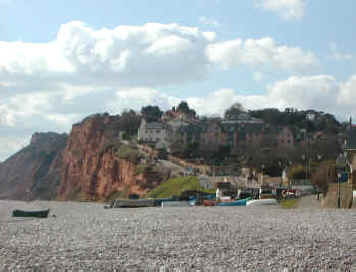 The beach is overlooked by towering red sandstone cliffs which are part of the Jurassic Coast Heritage Site. Visitors should note that the beach directly under the cliff (to the right when facing the sea) is a nudist beach, there are notices on the beach. There is a sandy, gently sloping beach at Littleham Cove, a good walk away over the cliff path towards Exmouth. 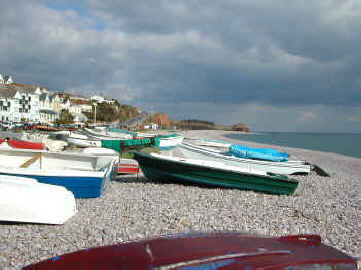 Budleigh Salterton derives its name from the ancient trade of salt panning which used to take place in the area. A further claim to fame arises from the fact that Sir Walter Raleigh was born nearby at Hayes Barton. The foreshore was the setting for the famous painting 'The Boyhood of Raleigh' which hangs in the Tate Gallery. Well worth a visit are the small beachside cafes and an excellent ice cream shop, The Creamery, in the town just off of the sea front at Budleigh. Also there is a good path up the cliff towards Exmouth which is part of the South West Coast Path route, it is well signposted from the town.